"We like to hear things calling to each other--we look for conversations among objects and other creatures--we are wired to find social cues, we are happy to find them." I love that! Well done KC v.Summer09. 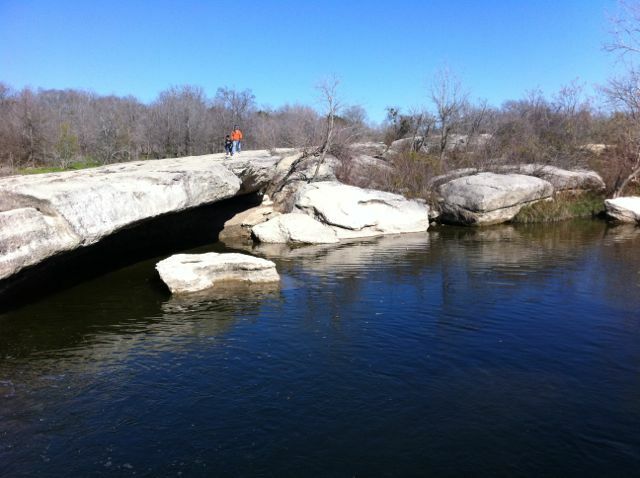 McKinney Falls, 12/31/11. You can't quite see the alleged buoy in this shot, but almost. "The POWER OF REPETITION--repetition creates its own meaning." "Approach writing like it's holy and don't make a big fuss about it." I like that -- it's unexpected that holiness means less fuss, but also very true. The sacred is too important for fuss. I need to paint that on my laptop. Boy fishing: "Dad look a buoy!" Mom sitting between them: "It's a beer can."